Towson won the three-day Gulf Coast Showcase tournament in Florida this week with a trio of impressive performances, claiming its first regular season tournament championship since winning the Baltimore Beltway Classic in 1990. The Tigers (5-1) clinched the tournament victory with a 70-67 victory over Georgia Southern (5-1) Wednesday night inside of Estero Arena. Towson started the game sluggish, remaining scoreless for nearly four minutes before junior forward Alex Thomas sunk a pair of free throws. The entire game was a physical affair, as both teams combined for 44 personal fouls and 63 foul shots throughout the matchup. The Eagles hit their first shot of the game, but suffered a 3-for-20 shooting slump following that score. Thomas and sophomore forward Justin Gorham were big reasons for that scoring drought, as the duo provided an intimidating inside presence. Gorham hauled in seven rebounds in the first half, while Thomas contributed five boards and two blocks in the period. The Tigers took a solid 29-20 lead going into the break, and came out of halftime firing on all cylinders. Senior guard Eddie Keith II got an easy layup to start the half, and the team kept the momentum rolling from there. Fellow senior guard Mike Morsell drained a three-pointer just under two minutes into the period to give Towson a 36-22 advantage, its largest lead of the game. Towson limited Georgia Southern’s three-point shooting with suffocating defense in the second half, holding them to just 25 percent shooting from behind the arc. This allowed the team to control the tempo and pound the ball inside to draw fouls. The most dramatic point of the game came at the free-throw-line as Towson held a 70-67 lead. Morsell missed his second free-throw-attempt with under five seconds left, giving Georgia Southern a chance to tie the game, but a solid defensive stand helped TU seal the win. Morsell led the Tigers in scoring with 16 points, and finished the game as the tournament’s most valuable player. Senior guard Brian Starr also had an impressive showing as he racked up 15 points on the day and earned all-tournament honors. Prior to the dramatic championship win, Head Coach Pat Skerry captured his 100th victory with a 79-71 win against Penn (5-3) inside of Germain Arena Tuesday night. Morsell, along with other players on the team, fought hard to help Skerry reach this milestone. Towson played a hard-nosed brand of defense in order to limit Penn’s scoring. Penn jumped out to an early 19-9 lead after drilling three shots behind the arc, but a violent dunk by Gorham shifted the momentum in favor of Towson. Towson exploded for a 23-4 run and took a four-point lead heading into the break. Penn came within two midway through the second half, but Towson went on a 12-3 run to take a 68-57 lead. Towson shot 4-of-5 from three-point range in the second half, while holding Penn to just 1-for-8. The team held on for the win with its strong second half defensive showing. 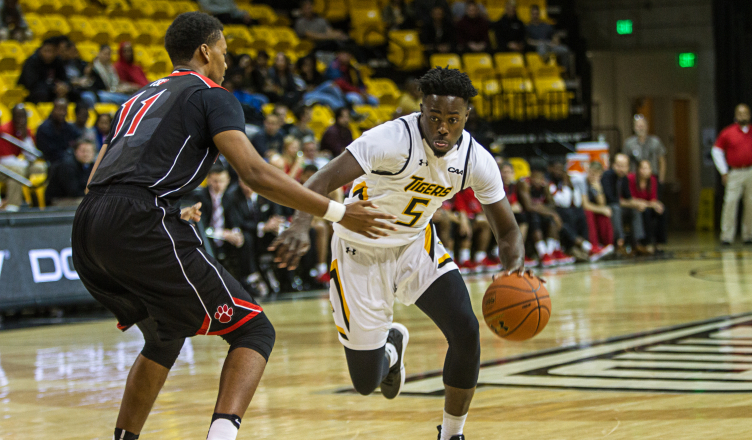 Towson returns to competition Monday, Nov. 26, when the team hosts Saint Mary’s College of Maryland at SECU Arena. Tipoff is set for 6 p.m.